DWDR is an exciting circa £250 million regeneration development by the Port of Dover, which will see the dynamic transformation of the waterfront, designed to attract a host of shops, bars and restaurants with Dover's unique backdrop of harbour, cliffs and castle, as well as a new cargo terminal and distribution centre, creating greater space within the Eastern Docks for ferry traffic and much needed employment opportunities for the local area. The new construction will include two berths, marina pier, marina curve, bascule bridge and navigation channel with sector gates and mitre gates. 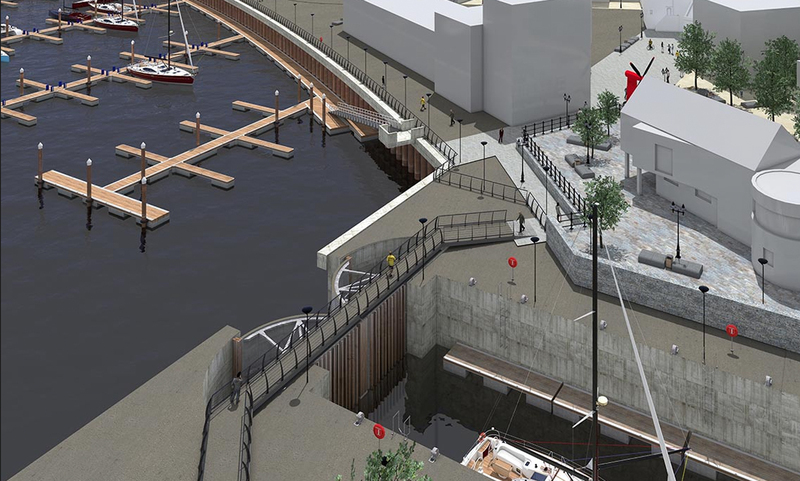 As part of this development programme, Qualter Hall is delighted to have secured a major contract through principal contractor VSBW, a joint venture between Volker Stevin and Boskalis Westminster, for the design, manufacture, delivery, site installation and commissioning of the bascule bridge, sector gates, mitre gates and stoplogs. Work has already commenced on site and commissioning is expected to be completed first quarter of 2019. • Width 15.1m comprising, 7.3m carriageway, plus 3.6m shared footway and cycle-way to either side of carriageway, plus 0.3m each side to parapet faces. • Scope includes the complete bridge structure, mechanical parts and the operating system comprising hydraulic power pack, two lift cylinders, pipework, cabling, electric / electronic controls, etc. • Scope includes the complete gate structure, mechanical parts and the operating system comprising hydraulic power packs, cylinders, pipework, cabling, electric / electronic controls, etc.